Still using that oil-free cleanser your mom gave you when you were 13? To look flawless and fabulous at every age, it's time to rethink your skin routine. 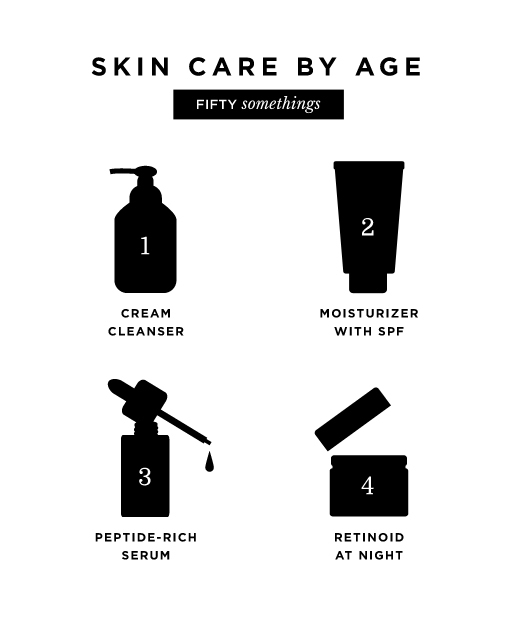 Here, your decade-by-decade anti-aging arsenal. If you're in your 50s "Moisture, moisture, moisture," says Waldorf. This should be your main concern in your 50s. Loss of tone, hollow eyes and sagging are your biggest issues, and creams and serums can only do so much. If you're looking for more dramatic results, in addition to using powerful products that contain peptides, retinoids, or alpha hydroxy or amino acids, consider talking to your derm about laser treatments and other non-invasive or invasive skin rejuvenation options. Step 1: Use a cream cleanser that will hydrate skin while it cleanses. Step 2: Choose a moisturizing cream that contains SPF to keep skin hydrated and protected. Because ingredients like retinoids can make skin more sensitive to the sun, daily use of sunscreen is a must. Step 3: For day, apply a peptide-rich serum under your SPF daily to help build collagen. Look for one that also contains antioxidants to fight free radicals or hyaluronic acid to lock in moisture. PCA Skin pHaze 25 ExLinea Peptide Smoothing Serum, $102, contains all three ingredients. Step 4: At night, apply a retinoid before your moisturizer. Your moisturizer should contain phytoestrogens to help with hormonal aging, such as Ilike Phytoestrogen Moisturizer, $68. Step 5: Though it sounds too simple (and inexpensive) to be true, a simple petroleum jelly is a great way to lock in the moisture from your moisturizer, which is more important now than ever. One thing to note, petroleum jelly prevents water loss but doesn't attract moisture, so you can't actually skip moisturizer altogether. These are sound, useful tips. I've seen many women use Vaseline to moisturize and they have had lovely complexions. Would not use Vaseline on my face except to protect my hair line when coloring my hair. I agree with no vaseline on your face, maybe a dry patch! This is really informative. I think it's too general though. I'm in my early thirties and I still have combination skin. Not everyone in their 20s, 30s, so on will have the same skin types! time to add retinoids and peptides into my skincare routine.